A wildfire that moved so fast that firefighters couldn’t hope to stop it quadrupled in size Nov. 9 after destroying several thousand buildings and leveling much of a Northern California town of nearly 30,000 people, authorities said. Only a day after it began, the fire near the town of Paradise had grown to nearly 110 square miles and authorities said it had claimed lives, although they offered no specific number or any details. The entire town was ordered evacuated, setting off a desperate exodus in which many motorists got stuck in gridlocked traffic and abandoned their vehicles to flee foot. 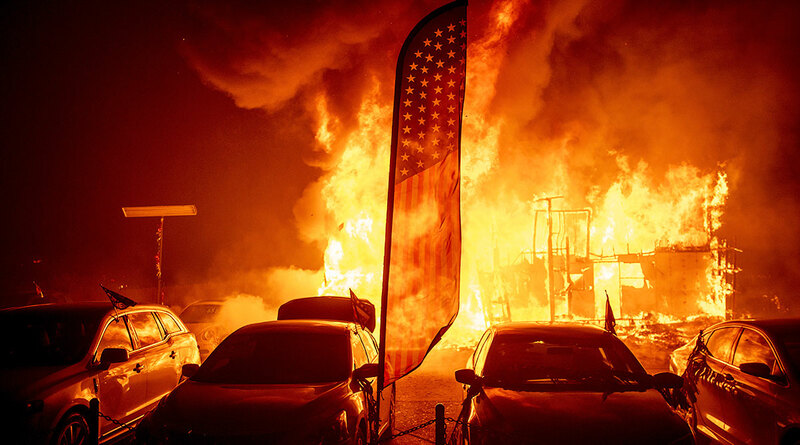 People reported seeing much of the community go up in flames, including homes, supermarkets, businesses, restaurants, schools and a retirement center. With fires burning in Northern and Southern California, the director of the Governor’s Office of Emergency Services put the number of people forced from their homes at 157,000. The massive blaze that hit Paradise spread north Nov. 9, prompting officials to order the evacuation of Stirling City and Inskip, two communities north of Paradise along the Sierra Nevada foothills. The wind-driven flames also spread to the west and reached the edge of Chico, a city of 90,000 people. Firefighters were able to stop the fire at the edge of the city, where evacuation orders remained in place Nov. 9, Cal Fire Cpt. Bill Murphy said. With ash falling and the sky darkening to a menacing shade of black, evacuees from Paradise sat in stunned silence Nov. 9 outside a Chico church where they took refuge the night before. They all had harrowing tales of a slow-motion escape from a fire so close they could feel the heat inside their vehicles as they sat stuck in a terrifying traffic jam. “Most of them were immobile, with walkers or spouses that were bed-ridden, so we were trying to get additional units to come and try and help us, just taking as many as we could,” he said. In Southern California, about two-thirds of the city of Malibu was ordered evacuated early Nov. 9 as a ferocious wildfire roared toward the beachside community that is home to about 13,000 residents.